This Privacy Statement applies to the web sites and mobile applications provided by ChuChu TV (collectively, “we”, “our”, or “us”). This Privacy Statement governs your use of our Sites and Apps, regardless of how you access or use them. By “Sites”, we mean any website or URL of ours that we have linked to this Privacy Statement and all features, applications, content, and downloads that are operated by us and that are available through the Sites, and by “Mobile Apps” and “Apps”, we mean our products and services that we make available via mobile telecommunications platforms and/or through social networking platforms or app stores, if you are visiting the Sites, please also review the Sites’ Term of Service. We want you and your family to have fun surfing all our Sites and using our Apps, and urge you and your family to follow common sense whenever disclosing personal information – on this Site or anywhere else. We encourage you to review our complete Privacy Statement in detail, as it includes important information, but provided is a short summary for convenience. We take many special precautions to protect the privacy of children under 13. At our websites through our apps intended for children, we do not collect personal contact information (like full name, birthdate, phone number or home address) from children without the consent of a parent or legal guardian, except in limited circumstances authorized by law. We collect some information (like IP address, mobile device UDID, operating system, etc.) automatically and use technology like cookies to provide functionality and support our operations. We do not permit interest-based advertising on Sites or Apps directed to children under 13 or where we have actual knowledge that a child is under 13. We do not ask for more personal information than is necessary for a child to participate in an activity. We take steps to prevent children from posting or publicly disclosing personal contact information. Parents can ask us to update or delete their children’s information. We use technology, like cookies, to recognize visitors by their user name when they revisit our Site and to screen for age in accordance with the Children’s Online Privacy Protection Act (“COPPA”). We may also use technology for similar purposes in our Apps. We also use technology to facilitate the ability to play games, to recognize returning visitors, for research, and for other purposes, including to screen under-age visitors from certain features or areas intended for older visitors, and to collect certain information automatically. We require our advertising service partners to comply with self-regulatory guidelines on targeted advertising. We do not permit interest-based advertising on Sites directed to children under 13 or where we have actual knowledge that a child is under 13. We sometimes collect information from adults and teens to serve your needs, manage our content and advertising, operate efficiently, and improve our products and services. We may collect personal contact information, like e-mail address or phone number, from consumers 13 or older when voluntarily submitted, including when needed to fulfill transactions. Registration may be required to use some Sites, services or Apps. We may obtain information from commercial sources and combine it with information we have collected. Certain information may be collected automatically at our Sites or Apps, like your IP address, UDID, browser setting, operating system, referring domain, language preferences, mobile carrier if you are using a mobile device, general location (e.g., zip code, but not specific address without consent) and other information. Third parties may also collect certain information via our Sites or Apps. You may be able to post or upload content, like comments, reviews, photos, etc. Registration may be required. Our Sites, services and Apps use technology, like cookies and web beacons, to manage registrations or access to certain features, store your settings and preferences, conduct age-screening, offer you personalized content, shop, help us understand the features that appeal to visitors, and manage advertising, among other things. We also work with third parties who offer analytics or deliver targeted ads online or through Apps. They use technology and collect device identifiers, such as your IP address or mobile UDID, and information on your activities, to do so. You can opt out of receiving targeted ads but will still see ads, although they may be less relevant to you. Tools are available to help you control some of these technologies. 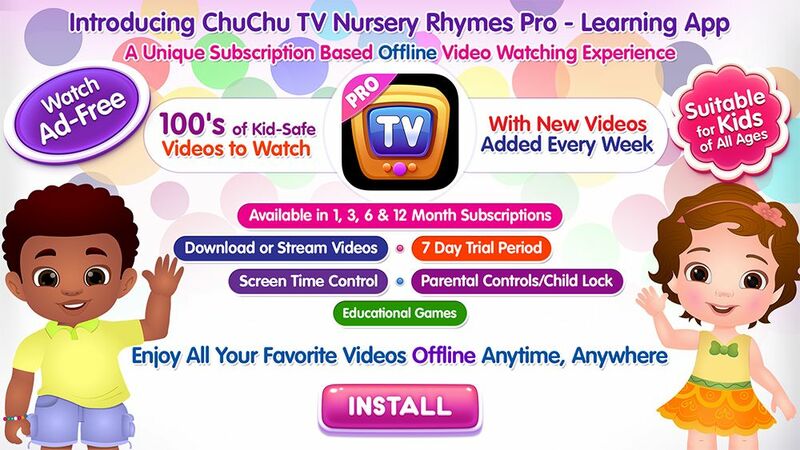 ChuChu TV and its agents or service providers or business partners may receive and store certain information automatically when you visit our Sites, use an online service or download or use a mobile App. This may include information on your browser type and operating system, the pages that you view, referring sites (sites you visited before you came to our site and sites you go to after you visit our site), IP addresses, or unique device identifiers associated with mobile devices, smart phones, etc. This information allows us to count the total number of “hits” on our Sites or installation and frequency of use of our Apps. We collect certain information using technology, like cookies and pixel tags. We may also use “Flash” cookies in connection with some games or other content to store game and activity progress for the Flash player or to store bandwidth information for the performance of the Flash player. The information stored in any Flash cookie deployed on this Site does not include your name. Find out more about these technologies and how you can control their use below. A “cookie” is a small file that does not contain personally identifiable information and is saved on your computer or mobile device. Cookies help improve your user experience, and allow us to analyze our Sites and Apps and manage our advertising. You can set your computer to warn you each time a cookie is being sent or turn off all cookies (except Flash cookies – see below) through your Internet browser (e.g., Internet Explorer or Safari). Check your browser’s Help menu or your built-in mobile device settings to find out how. Some mobile devices store cookies not only in areas connected to the browser, but also in areas that are app-specific so these cookies cannot be controlled by the browser settings. Check your app settings options on your mobile device to find out how to manage or delete cookies that may be stored in these other areas. Please note that if you do not accept cookies, some features or activities may not be available to you. Flash cookies, also known as local shared objects (“LSOs”), are built for use with Adobe® Flash® Player. LSOs act like cookies in that they store information to provide you with a more customized experience, but LSOs can store complex data that cookies cannot, and LSOs are not deleted or rejected if you set your browser to delete or reject cookies. The information stored in any LSO deployed by our Sites do not include your name. Although browser settings will not allow you to manage LSOs, you may be able to manage them in other ways. To find out more about how to manage or delete LSOs, visit http://www.adobe.com/products/flashplayer/articles/lso/. We also use other technology, called web beacons, pixel tags or clear GIFs, to provide us with other important anonymous information, such as when an e-mail has been opened. Companies that advertise on our Sites may also place web beacons in their ads to help develop statistics on the effectiveness of advertising at our Sites. We do not control web beacons in third party ads. For some Apps or services, we or our third party service and content providers and analytics companies may collect location information, including location information provided either by a mobile device interacting with one of our Apps or associated with your IP address or WiFi network. These features might enable you to engage in activities like find a nearby store or play certain games, for example. You can generally limit or prohibit the collection of location information by using the built-in settings on your mobile device. You will typically be notified if the App or service collects location information and given a chance to agree. We do not permit collection of precise location information (actual address) in mobile Apps without your consent. Child-directed Apps do not collect precise location information. We respect your choices about receiving promotional offers and updates from us. Your device may allow you to block or manage push notifications, location information, in-app purchases, or ability to access the web. Within our family of companies, and with our agents and service providers. As necessary to satisfy a legal request, protect property or personal safety, when a business is bought or sold, or as otherwise allowed or required by law. Our Sites or Apps may link to or use other content from the Internet, including content offered by third parties that we do not control and whose privacy and data collection practices may differ from ours. Your computer or mobile device settings may allow you to block or partially block web access, but those settings may not be effective in all cases. This Site and the servers that make this Site available may not be located in your country of residence and are governed by U.S. laws. By using this Site, you agree to the transfer, collection, processing and use of data by this Site and us. This Site, the servers that make this Site available, and databases where we house information may not be located in your country of residence, and applicable privacy laws may differ. However, we take reasonable steps to safeguard personal information as outlined in this Privacy Statement. By using this Site, you agree to the transfer, collection, processing and use of data as set forth in this Privacy Statement, our Terms and Conditions, and any other terms provided at the time of collection. However related to mobile apps, the servers that store the data will be of the respective platforms. We will update this Privacy Statement from time to time by posting the updated Privacy Statement online. We will not change how we handle previously collected information without providing notice. If you are a resident of California, you have certain rights. Under California Civil Code § 1798.83, California residents have the right to receive, once a year, information about third parties with whom we have shared information about you for their marketing purposes during the previous calendar year, and a description of the categories of personal information shared. To make such a request, please send an email to privacy@chuchutv.com and we will respond to you within 30 days of receiving such a request. We strive always to be transparent and clear about our policies. Please contact us at privacy@chuchutv.com if you have questions. ChuChu TV adheres to the U.S. Children’s Online Privacy Protection Act of 1998 (“COPPA”) and the guidelines of the Children’s Advertising Review Unit (“CARU”) of the Council of Better Business Bureaus, Inc. in our web Sites, online services and Apps directed to children under 13. Wherever we refer to “children” or a “child” in this Privacy Statement, we mean children under 13. Please help us protect your children’s privacy by instructing them never to provide personal information (like their full name, e-mail address, home address, telephone number, etc.) without your permission.